and that I would learn volumes about food in a seriously hands-on way. My evolution as a cook, and as a lover of all things fresh and local, has been dramatic and thrilling. Once upon a time, I didn’t even know what kale was. Now, I practically keep it in my pockets. I have been incredibly fortunate to cook with JLVF’s ingredients each week from May to December, expanding my horizons, thriving on the necessity for creativity, and bumping elbows in the kitchen with my husband, Adam Price, to bring you fun and delicious dishes corresponding with each week’s edible, seasonal gems. I began blogging in the off-season, following my first stint with Jackson-Lowe, because I couldn’t keep quiet about what was happening in our kitchen. I’ve been transformed by this opportunity! I hope the recipes and insights I provide this season will inspire you to roll up your sleeves and spend some time in your kitchen. 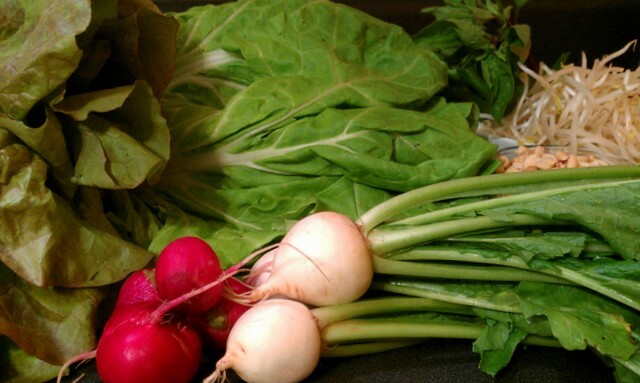 Even if you’re not a part of a local CSA, or a resident of Georgia, there are plenty of opportunities to find regional produce at the height of flavor and quality. Growing seasons and crops vary depending upon where you live, but all of the meals I create and share here can be modified to feature any veggies you have on hand. All of my work will be yours to adapt. I believe that you can make any of these dishes your own. Feel free to take pieces and parts of meals I post and tweak them to your tastes. 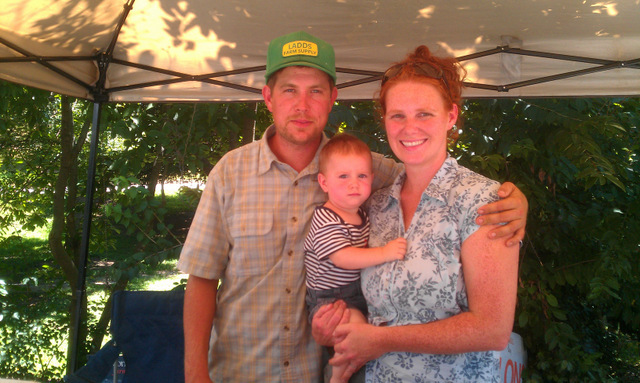 Last week, when Mecca shared the list of treats that would be in the first CSA box, I was bowled over with anticipation. First of all, their strawberries are amazing. Adam and I got to take these lovelies home from the Grant Park Farmers Market as sort of a sneak preview of the inaugural CSA box. 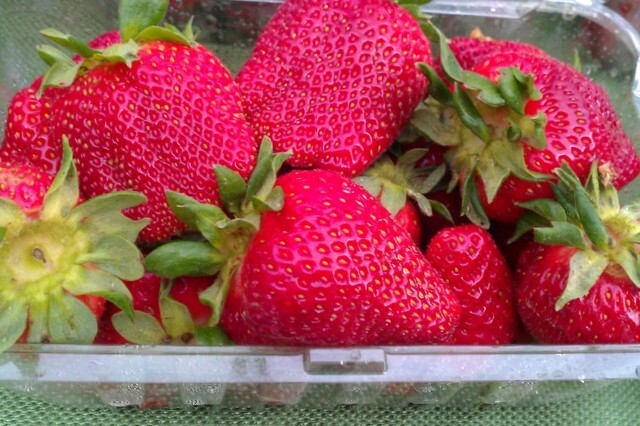 My first bite of strawberry was exhilarating- like a flash back to times when things were simpler. All I could think is, “This is why people created strawberry flavoring!! They wanted to mimic this amazing party that’s happening in my mouth right now.” Yum! 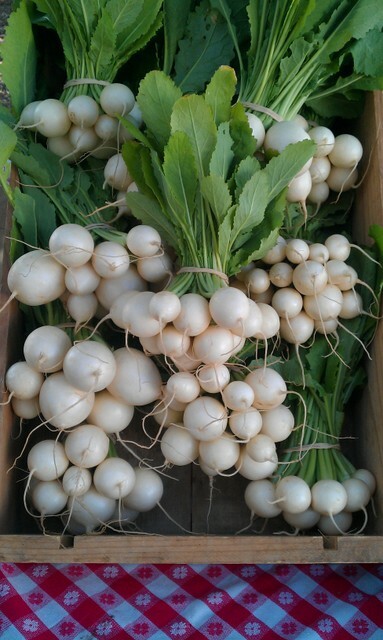 mild white turnips, wonderful in salads. Their greens are excellent as well. Not bitter, but tender and delicious. an easy-going kind of radish. 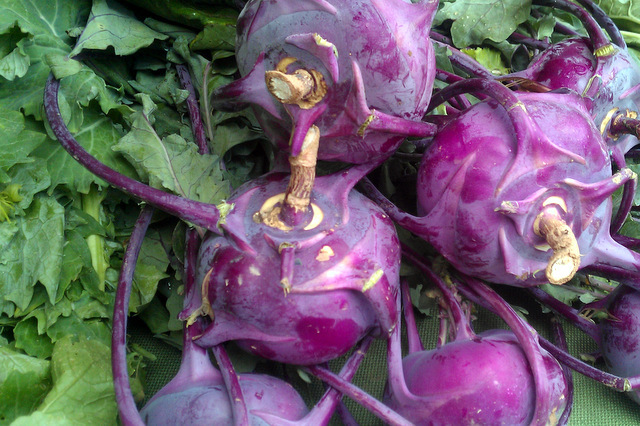 You can eat them raw, enjoy them in a stir fry, roast ’em, or grill ’em. Mellow and yummy. so wonderful! Great to chop into ribbons and wilt down in a salad, or to blanch and wrap around the ingredients of your choice- making little kale presents. Or, you can cook and incorporate the piney leaves into pastas, grits, pizzas, frittatas…into just about any dish, really. Next on the list, Red Romaine Lettuce- Jackson Lowe’s lettuces are always tender and kind of mind-blowing. 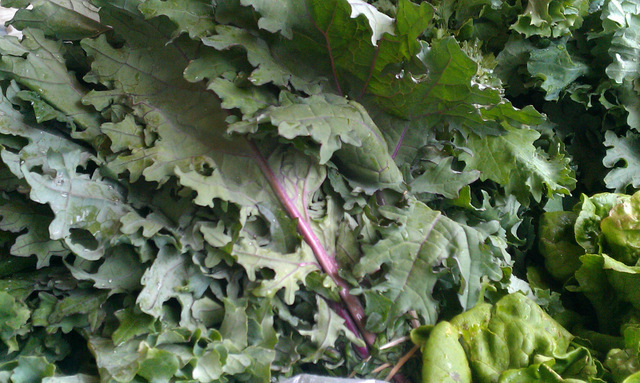 Makes you want to eat like a rabbit, pulling leaves off one by one and enjoying the freshness. 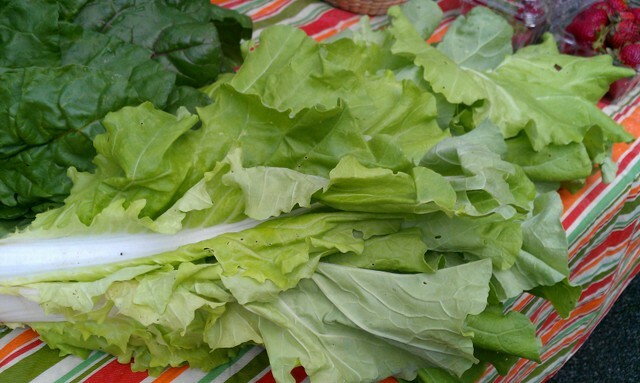 while this leafy green looks like a lettuce and feels like a lettuce, it’s actually a type of mustard green. It boasts a little bit of that mustardy bitterness, but it’s not overwhelming at all. I’d never seen or heard of Tokyo Bakana before last week, but now, I am a huge fan. I say this was the arm twister because there’s generally one ingredient each week that sort of twists my arm into creating a particular kind of meal. This Asian lettuce sent me over the edge and into the pool of – yes, the first CSA meal of the year will be an Asian-inspired salad that will knock my socks right off. And, oh ma gaaaahhhh. This meal far exceeded my expectations. Adam and I were both licking our bowls at the end of dinner, eyes all big and round with amazement. How could one little salad be so satisfying and scrumptious?!?!? Oh- it starts with the freshest ingredients. So, if you don’t have a salad spinner, I highly recommend buying one STAT. It will make your life much, much easier. It’s important to rinse your lettuces and greens well, as they will have some dirt on them. They come out of the ground! Yay! 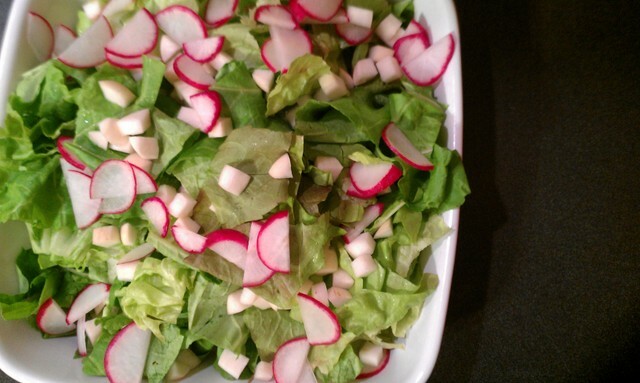 Having dry leaves when dressing a salad is key to making the dressing stick to each and every leaf. Who likes a soggy salad? Not this girl. 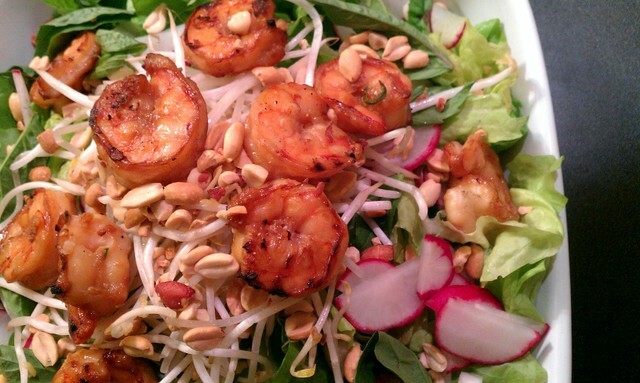 While you spin your lettuce, you can marinate your shrimp. *Soak three wooden skewers in water for about 20 minutes, so they won’t burn on the grill. 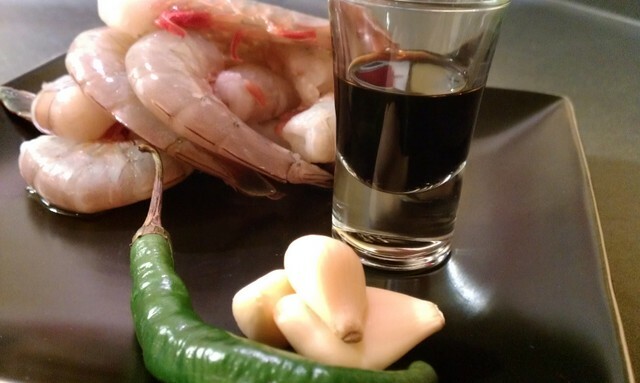 Simply toss your shrimp to coat them in the marinade and let them hang out for at least ten minutes. Ours sat for about 30 minutes and they tasted amazing. 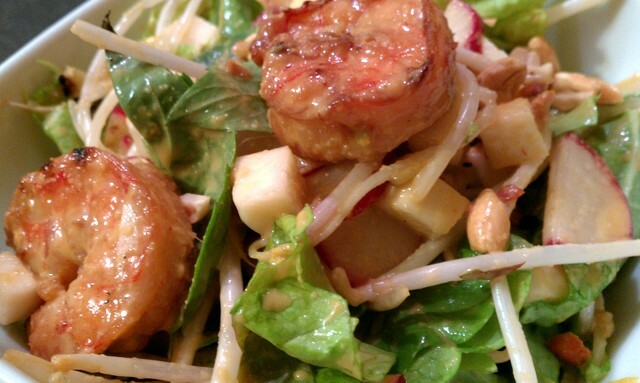 Once your shrimp are swimming in all that flavor, go ahead and whip up your dressing. Place all ingredients except for olive oil in a small bender or food processor. Pulse to combine ingredients. Then, begin slowly streaming in olive oil as you blend- several Tablespoons up to about 1/4 of a Cup or so. 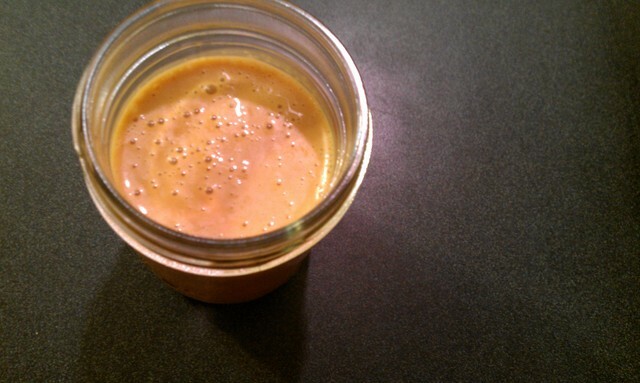 Drizzle and blend until you hear or see or feel the dressing thicken up (emulsify). Once your dressing has the consistency you like, give it a taste. Then, adjust flavor to your liking. If it needs a little more sweetness, add a touch more honey. More tang- go for a splash more vinegar. More salt- a splash more Tamari, etc. 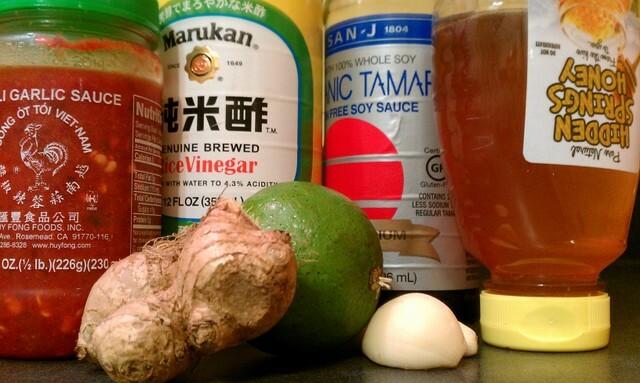 The dressing should be well-balanced and not too sweet, with some good zing from the ginger. Next, fire up your grill to high heat, and very carefully oil your grates with Canola oil when the heat is at about medium. A clean, well-oiled grill is a must! Fill a bowl with your pretty, dry lettuce leaves. 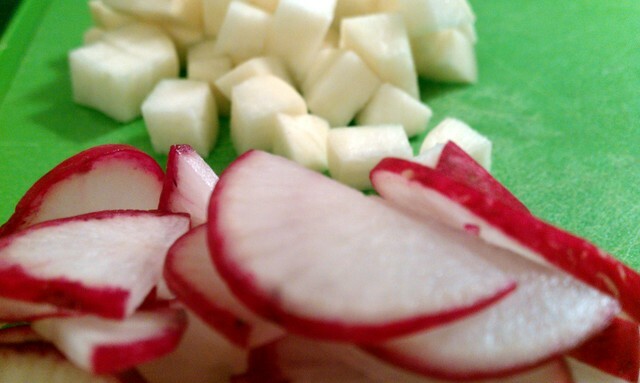 Slice your radishes and dice your turnips. Top your lettuce with the prepared veggies. 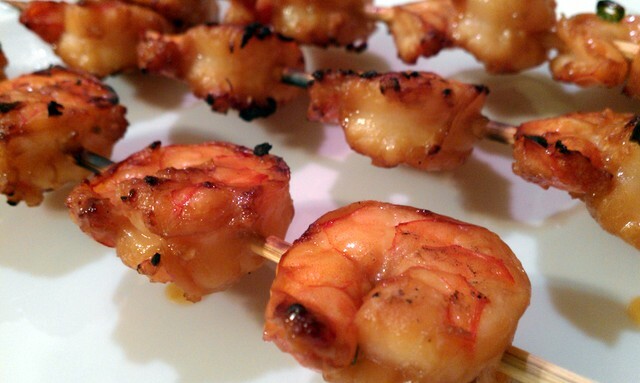 Then, remove your shrimp from the marinade and thread them onto your soaked skewers. I like to slide my shrimp on, piercing them through the head and tail parts, so that they lay flat on the skewer. 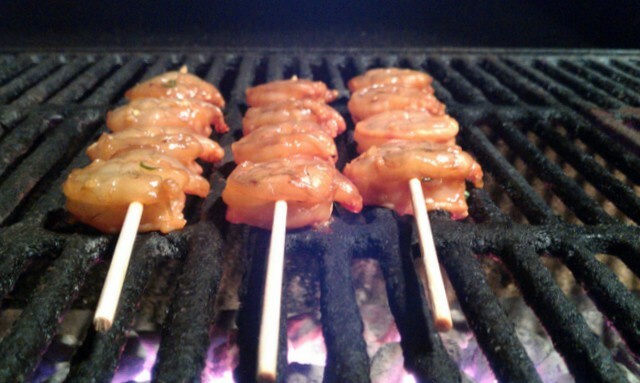 Place your shrimp lollipops over the fire and grill quickly. Literally- only about 2 minutes on the first side and a minute on the second side. Shrimp are finished when they are just firm and curled up into a U shape. Slide those beauties off the skewers and add the finishing touches to the salad. 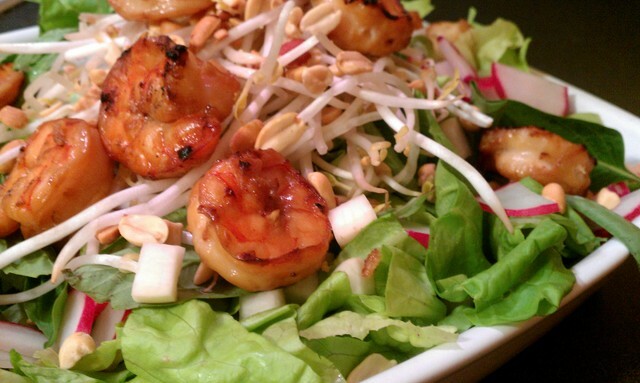 Scatter your mung sprouts, whole Thai Basil leaves, and peanuts, and then place your shrimp on top. So gorgeous, I ALMOST didn’t want to dress and eat it. Oh, but we did. Tip your jar and drizzle the vinaigrette sparingly over the salad, and toss to coat all of the goodies in your eat-it-with-a-spoon dressing. Sit yourself down and prepare to be wowed. This salad was insanely delicious. The char-kissed shrimp were so flavorful, and they married beautifully with the dressing. Their texture was spot-on. Tender and perfectly cooked. The lettuces were both crisp and gentle at the same time. The freshness was front and center. The slight bitterness from the mustard green family worked wonderfully against the salty, spicy, gingery goodness. The mung sprouts added a burst of cold moisture with each bite. The peanuts brought a rich nuttiness to the party. And the Thai basil leaves were the most awesome surprise anise-y pow! 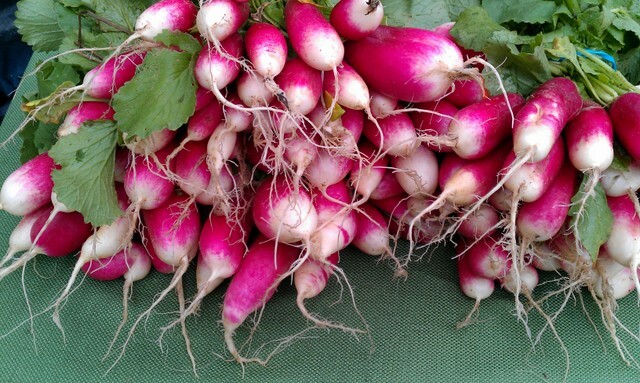 The crunchy radishes and turnips made my mouth happy. 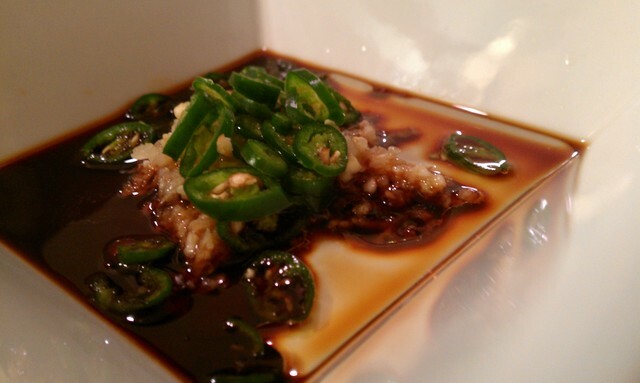 The whole combination was a true harmony of flavors and textures. I’d do it all over again today. Actually, I ended up eating the freezing cold leftover shrimp (which I am not usually the biggest fan of) dunked in the dressing the next day for lunch and it was un-real. You are certainly free to omit, add, or change any of the ingredients above to utilize whatever you have on hand. If you want to use cilantro instead of Thai basil, go for it. Or you could add mint! Use regular basil. All would work well. If you want to substitute cashews for peanuts, that’s an easy switch. Got carrots and want to add those too? Please, be my guest! 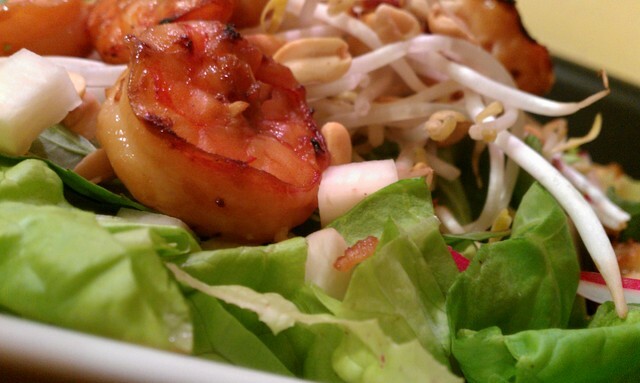 You could use chicken, steak, or pork in place of the shrimp – or keep the salad totally vegetarian. The most important thing to remember is to have fun while you’re creating your dinner. Embrace the freshness of spring’s bounty and share it with someone you love. Or don’t. You can hog it all to yourself!!! Let me know how you decide to make this fun salad your own!